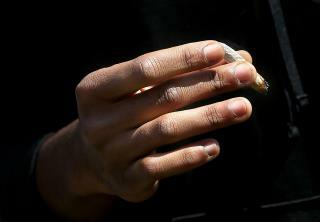 (Newser) – America is a much mellower nation than it was in 2002, or so suggests a new study on marijuana usage published in the Lancet. One of the most unexpected findings according to study author Dr. Wilson Compton is how many American adults take a puff daily or almost daily: Between 2002 and 2014 the number leaped from 3.9 million to 8.4 million, the latter representing 3.5% of the population. It's one of many figures that are up, reports the Guardian, which explains the conclusions are based on the responses of 596,500 adults participating in the US National Survey on Drug Use and Health. CBS News points out the surveying occurred before recreational pot use was legalized in any US state. I've been a fairly regular consumer of cannabis for 41 years. My usage hasn't changed, just the quality and quantity of available smoking material! No kidding. All I ever wanted to do was be invisible. It sounds like even more people are becoming immune to DEA scare tactics. Take a huge toke in the name of liberty.